Back pain is possibly one of the worst types of pain you can experience. It affects how you use the rest of your body, makes it difficult to get the physical movement and activity you need, and can often lead to pain in your legs or other extremities. However, there are quite a few side effects associated with using pharmaceutical pain relief methods. Instead, learn more about using natural foods that fight pain. If you are used to using pharmaceutical treatments for your back pain, you have likely seen what kind of side effects they can have. Over-the-counter treatments can cause nausea and other digestive problems. Prescription pain medications are even worse. Not only can they cause digestive issues, you may become dependent on them and they can often lead to drowsiness or fatigue. On the flip side, consider that food does not have side effects. Rather, consuming food for pain relief involves using natural vitamins and minerals in food to treat your pain. There are many different foods that can give you the benefits of pain relief without the side effects of pharmaceuticals. Next time you feel a backache coming on, reach for one of these foods instead of the pill bottle. Tart cherries are an excellent food for back pain relief. They are especially beneficial if your back hurts because of exercise or heavy lifting. To get the benefits of tart cherries, you can either eat them as they are or drink a glass of cherry juice. Make sure you stick to tart cherries, not the sweet varieties. If you have a backache that’s killing you, pour yourself a cup of coffee, sit down, and relax. Research has shown that a cup of coffee works as well as conventional pain medications. You just need one cup to benefit from the caffeine found in coffee. Back pain can come from lots of different sources. If you get back pain because of menstrual cramps, evening primrose should be in your medicine cabinet. The oil found in this flower can offset cramps and back pain. Omega-3s are an important part of an effective back pain relief routine. However, it is much better to get your nutrients from food than from supplements. Salmon is an excellent source of omega-3 fatty acids. Next time your back pain starts flaring up, prepare yourself a serving of salmon. 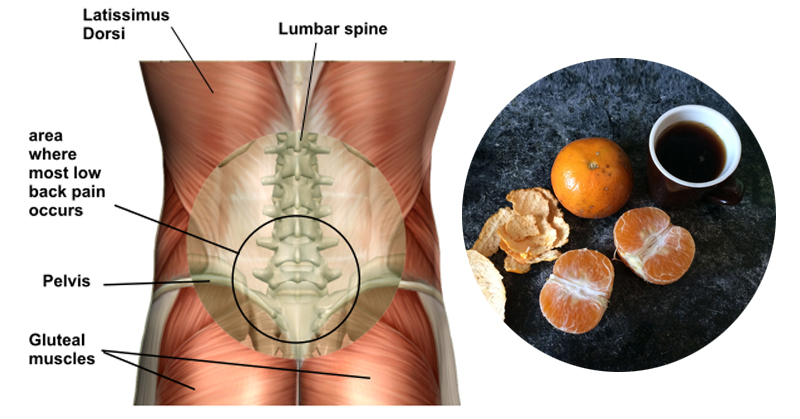 Thanks to the high vitamin C levels of oranges, they are a natural choice for people dealing with back pain. Eating oranges can reduce inflammation that often causes back pain. Just as in some foods can improve back pain, some can worsen it. If you are prone to back pain, avoid carbohydrates, artificial sweeteners, trans fats and fried foods, and food additives. In general, sticking to fresh, whole foods can significantly improve your back pain. Processed, sweet, and carb-loaded foods can make it much worse.